The new automatic camera upload feature in Dropbox asks if you want to upload photos every time a device is connected. Here’s how to disable the annoyance. 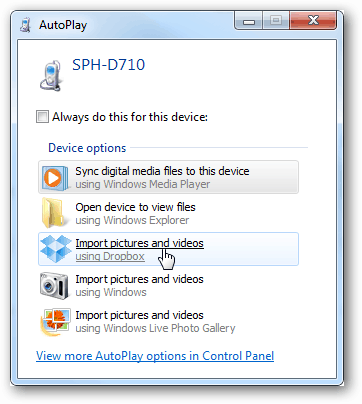 The Dropbox camera upload prompt pops up every time you plug a phone, camera or other storage device in to your computer. I charge my phone using a USB cord plugged into my computer, and no matter how many times I’ve unchecked “Automatically…” and told Dropbox “Never for this device” it still wants to pop up in my face and ask me about syncing my photos. Enough already! I just disabled the feature entirely. Here’s what you can do to turn it off too. 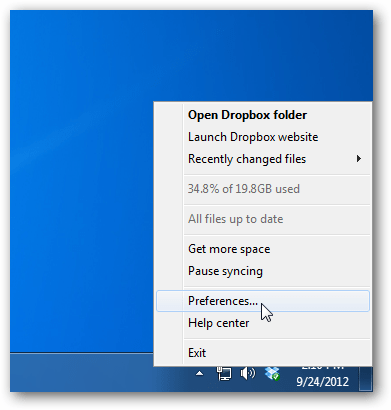 Right click the Dropbox icon from your System Tray and select the Preferences. 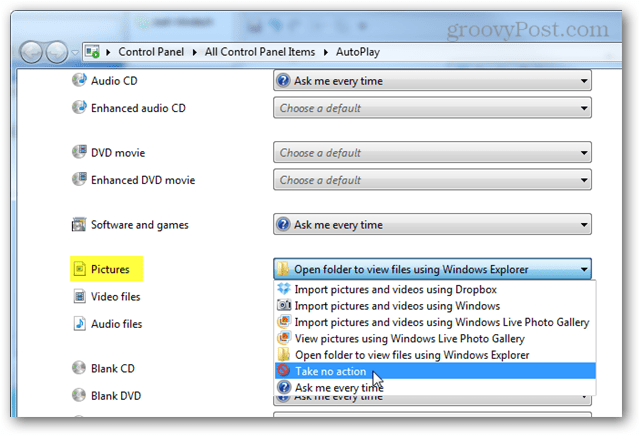 In the Preferences window click on Change AutoPlay Settings. This will opens up Windows AutoPlay settings. Scroll down to the Pictures category and then change it to Take No Action from the drop down menu. When that is done, it won’t pester you anymore with requests to sync your photos. If you want a compromise that doesn’t completely disable the feature, set Pictures to “Ask me every time” and then you’ll have the option to open the Dropbox Camera Uploader when you connect. 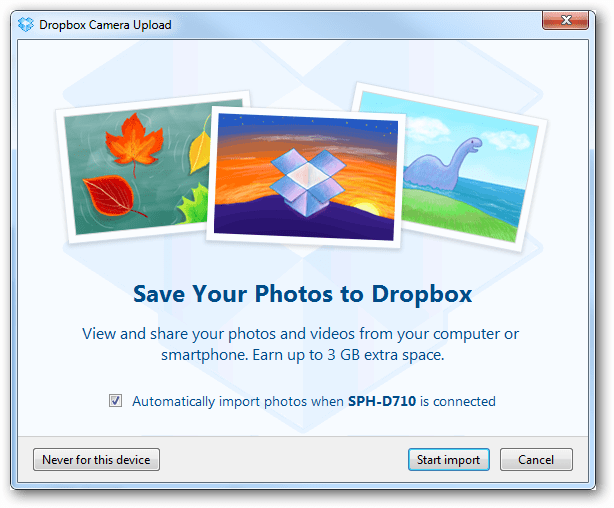 Is Dropbox Camera Upload still bugging you? If the above fix didn’t work, it may be because you’re running an experimental version of Dropbox. In one instance I had to disable the automatic sync request. I had to download Dropbox from the home page and downgrade it to the release version as the experimental build was causing problems. 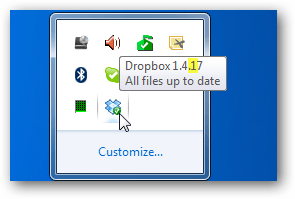 You can check which version you have by hovering your mouse over the Dropbox icon in your system tray. In this case I have version 1.4.7 installed, which isn’t a stable build. To find out what the current version is, go to the Dropbox Release Notes page and the latest date of a Stable build is the latest version. The latest version is always available for download from the main Dropbox.com home page. Although a bit confusing, at the time of writing 1.4.17 was the current release version, and 1.4.7 was experimental. Yeah, I know these services are trying to help people out by auto saving their stuff. Call me old-fashioned, but I definitely don’t need my pictures going up to the cloud all the time. I want to have control over all of my data number one, and pictures can be especially sensitive. So, I vote No on auto backup…and it shouldn’t be a huge thing, just check or uncheck a box and done. I have the reverse problem; I cannot re-enable USB syncing of videos with a cable! Very, very frustrating, because I have tried EVERYTHING, including deleting dropbox, uninstalling, reinstalling, unlinking, relinking. Even unlinked my phone, and uninstalled the app! And reinstalled. No dice. NO DICE. If I shoot a long video, I’d rather not use WiFi! And it will no longer let me use USB! Driving me crazy! Nothing I can do. I have e-mailed them, but I guess I have a to wait a day or so, so they can investigate. Why would they put an option that says “NEVER”? How stupid is that, if it really means “NEVER” and apparently it does! Windows 8 doesn’t have many other viable options, not as easy as Dropbox, so this is really annoying. Took ALL day after July 4, to get a fireworks video uploaded! I finally found a way to do it from the folder for the phone, but it wasn’t easy. It’s not like Win7. Need Dropbox to do it! 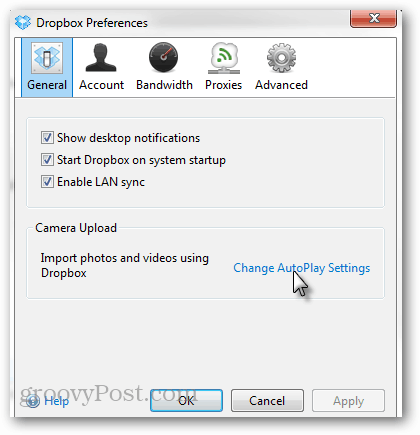 On windows XP pressing “Change autoplay settings” links through to a dropbox.com help page explaining what you need to do. Thanks. I have Win8, but that sounds like it should work. Dropbox said it couldn’t help me via email. I need that USB transfer. Well, I’ve tried setting the autoplay settings to Take No Action about a half-dozen times now, but it still pops up that @#$%^& window each and every time I plug my iPhone in. I’m just about ready to uninstall @#$%^& Dropbox if I can’t figure out some way to make it stop! Anyone have any other ideas? I had been bashing my iPhone and DropBox to stop sharing. But my PC would still smash through any attempt I made to dam the flow. It was your working form the M$, PC-end of things that did it for me. I just reclaimed 4gb back from DB as a result. How easy it has become for me to become reliant on the iPhone easy-peasy option that I hadn’t got all rowdy with my PC. I knew about those settings, but had relied solely on the DropBox, and iPhone functions to carry me through. Yeah Doesn’t work! I hate Hate HATE Drop Box for even screwing with the setting in the first place! Now even disabling autoplay completely the propmt comes up whenever I put a disc or fash media into the PC. If it wasn’t for customers at work wanting to use it I would delete in a heartbeat. I never ever recommend because of this and will not put on my personal computer under any circumstance. Programs like this earn my disgust so much I wish them nothing but abysmal failure! I hate Dropbox for this feature. I am running version 2.8.2, and Dropbox says this is the latest version. When I click “Change AutoPlay Settings”, and set them ALL to “Open folder to view files using Windows Explorer”, the damn DropBox message KEEPS appearing…EVERY TIME! Oh, how I hate it. The other thing that I hate about it is the way that it adds the little file to my flash drives, trying to keep track of just how much I hate it. Oh well…that’s my rant for the morning. Sage I am in the same boat as you. I have been going back with dropbox support for months and they simply do not get it. For some reason their software is written to rely on the Windows autoplay settings but is not honoring the fact that I have every single autoplay on “do nothing”. They need to have an ability to disable the “feature” completely. If you check “never for this device”, the software actually places a small hidden file on your device without you knocking. Dude thankyou so much! God that popup was annoying! Good tips! It has helped me a lot! Thank you! I did the ‘tqake no action’ but it did not work. You are a lifesaver. I was about ready to put my fist through the screen. It seems Dropbox has a better mobile app now, and I control what it uploads, and doesn’t upload from my phone. I let it do the automatic photo uploads (and then it downloads), but not video. So, now I can USB videos over to my PC pretty easily. It seems to have changed the desktop application quite a bit since Windows 8.1, and now I have seen that dialogue again, finally. Since I don’t want to turn off auto-downloads to my PC, I haven’t tried turning that off, but it looks like it’s working again since I upgraded to Windows 8.1. I think it will do it. At least, I have solved my problem; the mobile app no longer auto-uploads videos. I do it strictly by USB. A great relief because that destroyed the whole process. It would take forever if there was a video in there, and I couldn’t make it stop doing it. What was disturbing was the total lack of tech support when I first had this problem; I never had a software company basically say “tough luck” – or something to that effect, ever. I hope they have a better tech support dept. now, because that was the worst I had ever experienced. I am using ipod and everytime i am opening some files picture or videos it is automatically saved to dropbox of other user, i dont know about this. Can anyone help me so that person will stop bothering me to getting my files without my permission. Thanks for the great tip. 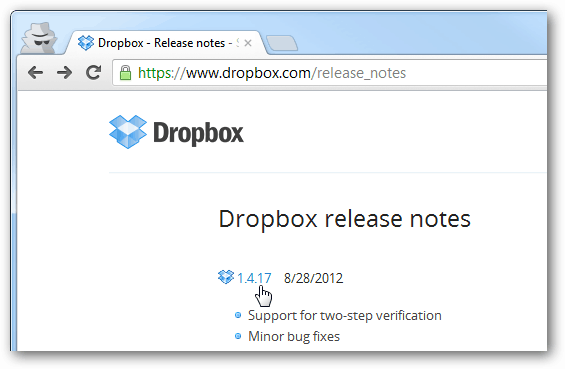 Since this article was published there has been a Dropbox GUI update. You now go to Preferences > Import > then click on Autoplay. Thank you SO much! I was stunned today when Dropbox demanded the photos from my camera. That’s NOT where I wanted to store them first. These instructions work, but only until I restart my computer. Then, they magically reappear, and dropbox autostarts (this is STILL unchecked in dropbox preferences), along with camera uploads again. Blast you, Windows 10! Thank you so much for this information. I find it so frustrating when programs change my routine without asking since I usually do not know how to fix it! I could not follow the first step but was able to go straight to the control panel Auto Play to achieve the same result.